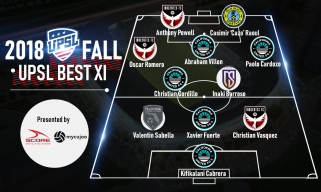 LOS ANGELES - March 7, 2019 - PRLog -- The United Premiers Soccer League (UPSL) is pleased to announce its 2018 Fall Season Best XI team. United Premier Soccer League Commissioner Yan Skwara said, "Congratulations to each and every player selected to the All-UPSL Team for the 2018 Fall Season! These players are a testament to their clubs and the communities they serve, and they're a major reason with the 2018 Fall Season was such a success. The UPSL Best XI is recognition of the hard work and determination players put in every day, and we are proud to have this group represent the league at its highest level." California United FC II goalkeeper Kifikalani Cabrera earned first-team honors, as did defenders Xavier Fuerte (California United FC II), Valentin Sabella (Florida Soccer Soldiers), Christian Vasquez (Inocentes FC), midfielders Inaki Barroso (Miami Sun FC), Paolo Cardozo (California United FC II), Christian Gordillo (California United FC II), Oscar Romero (Inocentes FC), Abraham Villon (California United FC II), and forwards Anthony Powell (Inocentes FC) and Casimir Raoul (Palm Beach Spartans). The UPSL Spring Season Best XI was selected by members of the league and journalists covering the UPSL.